1B Umpire Will Little ejected Phillies Manager Pete Mackanin for arguing a check swing (ball two) call in the top of the 8th inning of the Mets-Phillies game. With one out and two on, Mets batter Yoenis Cespedes attempted to check his swing on a 1-2 fastball from Phillies pitcher Michael Mariot for a called second ball by HP Umpire Ted Barrett, affirmed on appeal as "no swing" by Little. Play was reviewed and affirmed by the UEFL Appeals Board, the call was correct. 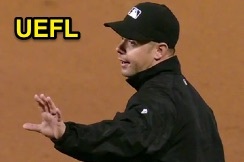 At the time of the ejection, the Mets were leading, 3-1. The Mets ultimately won the contest, 4-1. This is Will Little (93)'s fourth ejection of the 2016 MLB regular season. Will Little now has 19 points in the UEFL Standings (15 Previous + 2 MLB + 2 Correct Call = 19). Crew Chief Ted Barrett now has 10 points in Crew Division (9 Previous + 1 Correct Call = 10). This is the 189th ejection report of the 2016 regular season. This is the 75th Manager ejection of 2016. This is Philadelphia's 2nd ejection of 2016, 5th in the NL East (ATL 10; MIA 9; NYM, WAS 5; PHI 2). This is Pete Mackanin's first career MLB ejection. This is Will Little's first ejection since September 27, 2016 (Buck Showalter; QOC = Y [Balls/Strikes]). Wrap: New York Mets vs. Philadelphia Phillies, 9/30/16 | Video available via "read more."